Professional manager with ten years managerial experience, directing operations of security practices and regulations in organization. Lead a diverse team in conducting research, compiling data, and formulating strategies to improve the organizations processes. Composed, submitted and maintained theater-wide personnel accountability/manpower reported daily and ensure less than a 2% variance for military and US government compliance. Identified & analyzed issues, problems and additional challenges facing the program as well as formulate evaluated courses of action to resolving them. Analyzed logistical support and verified that all deploying personnel was sent to the appropriate location. Reported the status and completion procedures for ongoing projects accurately and promptly to directors. Prepared meeting minutes and edited subcontractor proposals, project punchlist, transmittals and memorandums for orga. Brought in supplemental service revenue of approximately $100k with projects averaging $50k Reviewed financial statements, sales and activity reports, and other performance data to measure productivity and goal achievements; determined areas in need of cost reduction and program improvements. Increased employee retention by 29%from previous year at a cost saving 45k by establishing new training programs, orientation program and recognition programs for new hires. Conducted resource planning and budgeting tracked costs to ensure adherence to budgetary limitations. Established and implemented departmental policies, goals, objectives, and procedures, conferring with board members, organization officials, and staff members as necessary. Developed relationships and communicated with customers, site managers, developers, land owners, authorities, utility representatives, or residents. Prepared manuals and trained workers in use of new forms, reports, procedures or equipment, according to organizational policy. 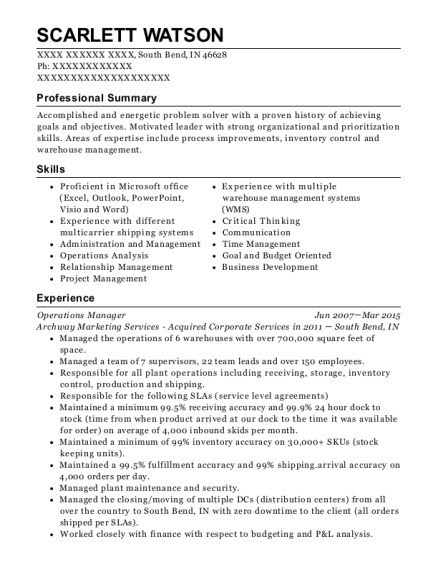 Completed data entry, tracked resumes and maintained the applicant tracking. Obtained statements from complainants, witnesses, and accused persons and record interviews, using recording device. Reviewed detailed records and performed thorough analysis to resolve 100% material issues and ascertain background, reputation, character, suitability, and qualifications of each subject. Conducted security audits to identify potential vulnerabilities related to physical security, staff safety, or asset protection. Designed security policies, programs, or practices to ensure adequate security relating to issues such as protection of assets, alarm response, and access card use. Trained subordinate security professionals or other organization members in security rules and procedures. Operated and maintained a $7.5 million state of the art sensor security system consisting of alarms and Closed Circuit Television (CCTV) for the Presidential Air Fleet. Commanded Air Force One security and safety of all Passengers from President, First Lady and other dignitaries on Aircraft. Interviewed witnesses or suspects to identify persons responsible for security breaches, establish losses, pursue prosecutions, or obtain restitution. unauthorized persons, or unusual occurrences. Examined records, reports, or other documents to establish facts or detect discrepancies. Conducted comprehensive on-site interviews with subjects, employers, associates, references, and other individuals to complete investigations. Analyzed completed police reports to determine what additional information and investigative work is needed. Obtained facts or statements from complainants, witnesses, and accused persons and record interviews, using recording device. 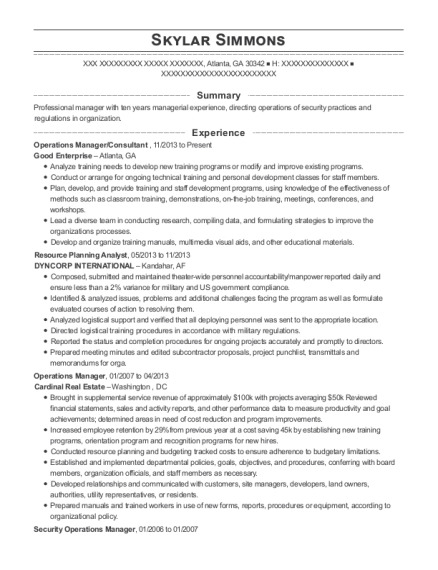 This is a resume for a Operations Manager in Atlanta, Georgia with experience working for such companies as Good Enterprise and DYNCORP INTERNATIONAL. 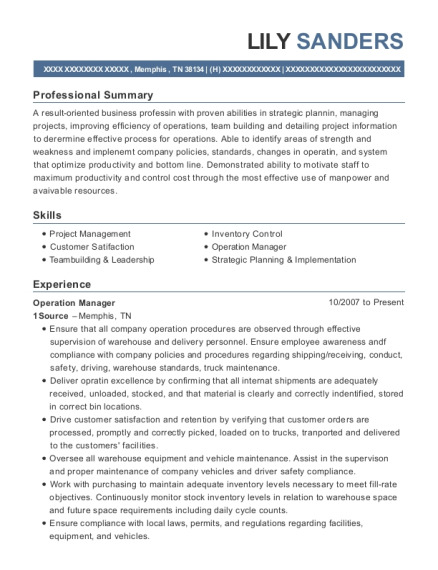 The grade for this resume is 0 and is one of hundreds of Operations Manager resumes available on our site for free. 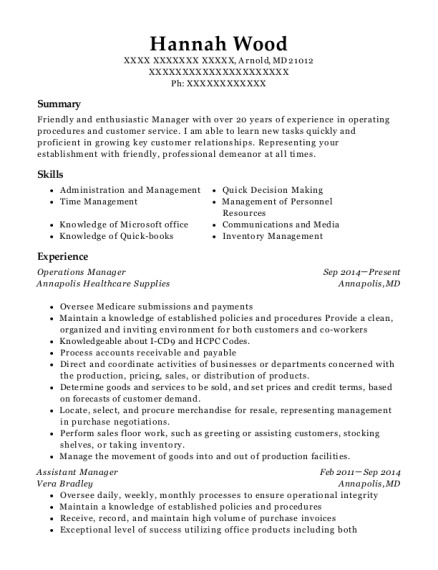 Use these resumes as templates to get help creating the best Operations Manager resume.